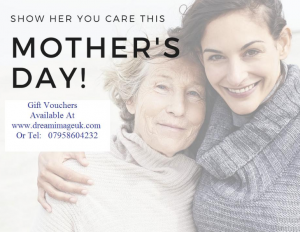 Mother’s Day – Show Her How Much You Care! This Mother’s Day Show How Much You Appreciate Your Mum! They do so much for us all year round, never complaining just getting on with it, sometimes we forget just how much they do, they are relentless. It is not until you have children of your own, that you realize exactly how much they have done for us over the years and in most cases still do, by caring for Grandchildren etc. So this Mother’s Day do something special for them, sure everyone likes to receive flowers and or chocolates but it is so nice when you are treated to some “Me” time be it a beauty treatment or a break away from it all, or a trip to the theatre with friends/family, put some thought into it not just opt for the easy flowers/chocolate option. What would your mother really appreciate? For those that have lost their mothers, remember they are still here with us, you just can’t see them anymore. People find comfort in different ways, some say if you see a feather that is spirit with you, a robin has the same meaning, other’s going to their grave side and just sitting thinking of all the good times, other’s special memories/photo’s etc. However you find comfort on Mother’s day,remember they are watching over you, sending you a big hug. This Mother’s Day let’s not take Mother’s for granted, do something really special for them, even if it is just giving them your time, as to often we don’t make time, just excuses! This entry was posted in Beauty Blog Post by admin. Bookmark the permalink.